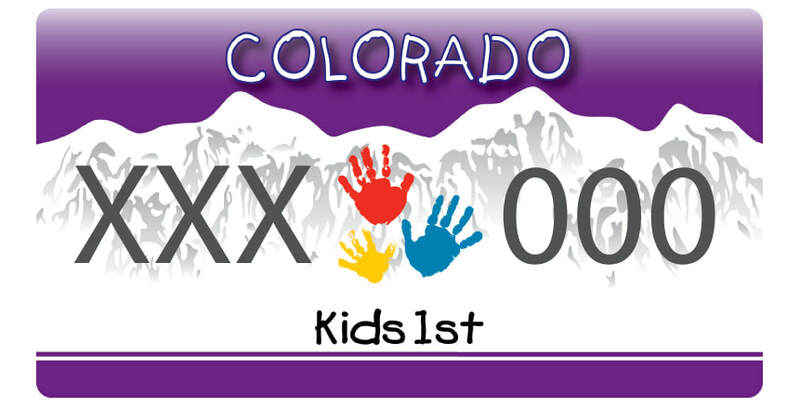 The Colorado Kids 1st License Plate is a specialty plate that promotes the health and safety of Colorado children. Every day, we are raising awareness on Colorado roads reminding drivers to ALWAYS put kids first. Money raised from the license plate goes directly back into the community. Click here to visit the Colorado Kids 1st website. License plate purchasers give a $30 donation to Colorado Kids 1st. Colorado Kids 1st provides a certificate of eligibility. Purchasers pay a one-time fee of $50 to the Colorado Department of Revenue. This $50 fee is standard for any specialty plate in Colorado. The DOR uses the money to fund transportation and road projects that help us drive more safely. Colorado Kids 1st uses the $30 to grow the Colorado Kids 1st Fund. The Colorado Kids 1st Fund gives grants to worthy organizations who are keeping Colorado kids healthy and safe. Click here to order your own Colorado Kids 1st license plate. Why Did RMRPI Create This Program? The Colorado Kids 1st license plate was Dr. Lisa’s brainchild to promote public awareness and become a sustainable funding source for child-related charities all over Colorado. The license plate raises funds to support local safety and health projects in two ways. The plate is available to approved non-profits as a fund-raising project with 100% of the $30 donation going directly to the local organization. Secondly, Colorado organizations can apply for grants from RMRPI. The grants, which are given on an on-going basis, are meant to fund programs that promote safety and prevent injury in Colorado children.